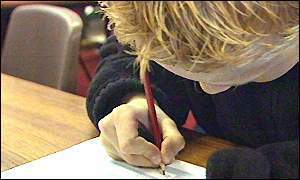 League tables have been called "divisive"
Secondary school league tables are to be abolished in Wales, almost a decade after they first appeared. Welsh Assembly Education Minister Jane Davidson said performance tables were divisive and placed an unnecessary burden on schools. Instead schools will publish their own results in their prospectuses and governors' annual reports, which parents will be able to compare with average figures for schools in the area and nationally. Jane Davidson AM: "Major step forward"
The decision - which has been warmly welcomed by the teaching unions - follows a similar move in Northern Ireland. The assembly has the power to make many of its own decisions on education policy. The abolition of secondary school league tables shows that Labour ministers in Wales have a very different vision for education than their counterparts in Westminster. League tables were introduced by the Conservatives to expose poor standards and enable parents to exercise choice. But they were viewed by many as divisive and a crude yard-stick. Jane Davidson AM has insisted that the new system of giving information to parents about their own schools, is a major step forward. "By scrapping the published booklets and digests we have immediately removed an administrative burden from primary schools who were required to distribute the digests to parents of pupils in their final year of primary education," she said. "A similar burden has also been lifted from secondary schools and I hope we can help even more by providing each school with their own summary results sheets." The minister said she was also determined to stop local newspapers publishing results in order of performance. Ms Davidson said the system of league tables was opposed by teachers and parents. In a statement, the Department for Education said Ms Davidson's decision was a matter for the education service in Wales and did not affect the position in England. "The government is committed to the continued publication of school performance tables in England," the statement said. How long will it be before England follows this excellent example? "They are an important part of our drive to raise school standards and they provide valuable information to parents." Indeed they are being extended: On Monday, BBC News Online revealed that primary special schools were to be included in this year's tables, due towards the end of the year. The department's statement also restated its commitment to bringing in "value added" measures to the tables, which attempt to show how much a school has improved pupils' performance during their time with it. A spokeswoman for the Scottish Executive said it had no plans to discontinue publication of Scotland's secondary schools' performance. "We are satisfied that publishing school-level data on examination results is helpful to parents, schools and the education sector more widely," she said. Gwen Evans, deputy general secretary of the Association of Teachers and Lecturers (ATL), said the Welsh Assembly had made "a bold move and one which should be universally applauded". Ms Davidson had responded rapidly and effectively to the views of parents and teachers following a thorough consultation, Ms Evans said. "How long will it be before England follows this excellent example? The way is clear for the kind of improvement everyone wants to see." Chris Keates, deputy general secretary of the NASUWT, said: "The National Assembly is to be congratulated for removing this divisive and unnecessarily bureaucratic system which had no educational value and was disliked equally by parents and schools". "Teachers in England will be understandably dismayed that now only the Westminster government remains clinging to the wreckage of the discredited league tables," he said. "Education is being radically changed by devolution"
"We need to know the schools that are successsful and those that are failing"
"Labour Ministers in Wales have a very different vision for education than their counterparts in Westminster"
"They are much too crude a tool"
"I think Jane Davidson should be saying councils will publish league tables"